If you are looking for easy cookie recipes, try this one. These peanut cookies are filled with the salty Spanish peanuts that still have their skins on. They are easy and everyone will love them. Of course, if someone has a peanut allergy, feel free to substitute another nut. 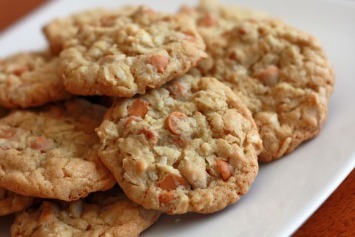 I have tried a similar recipe to this one, using peanut butter and NO flour, and believe it or not, they are fabulous. Crush the peanuts with a rolling pin. Place them in a small bown and stir in the flour. Beat the eggs. Beat in the sugar. Add the vanilla. Stir in the nut-flour mixture. Drop onto greased baking sheets. Bake at 300°F until the edges begin to brown, about 7 to 10 minutes. Do not overcook. Let the pan cool slightly before you remove the cookies. Tap the pan sharply against the table to loosen the cookies from the pan. Remove them to a wire rack to cool completely. Makes 5 dozen yummy peanut cookies. Feel free to use peanuts that have been skinned, but I wouldn’t use unsalted peanuts. That bit of salt in the recipe really adds a lot of flavor. If you can’t use peanuts use chopped nuts of any kind. I would try to stick with salted nuts. As I said above, the bit of salt really does add flavor. You can of course substitute nuts like walnuts or pecans if you prefer. Add extra flavor by adding in 1/2 cup of chocolate or butterscotch chips before baking. Find more easy cookie recipes here. Let me know what you think once you try them. If you like this recipe, I’d love you to Pin it to Pinterest, Tweet about it, Like it on Facebook and leave a comment below.